Jeremy Fernando chats with Marco and Adam in the reading room at Tembusu College, NUS about writing, art, music, and the edited collection Relational Syntax. 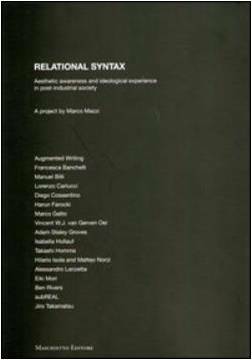 Relational Syntax: Aesthetic awareness and ideological experience in post-industrial society. ed. Marco Mazzi. Florence: Maschietto Editore, 2012. Marco Mazzi is an Italian essayist, art theorist and photographer living and working in Tokyo. He worked as an editor in the publication of books of contemporary Japanese poetry, such as The Other Voice, the first Italian translation of Yoshimasu Gozo’s poetry, and is the editor of the collection Relational Syntax. Adam Staley Groves is a Fellow of Tembusu College at the National University of Singapore. He is the author of Imaginality: Conversant and Eschaton, and Poetry Vocare. His current research engages posthumanities, politics, and future ontology. Jeremy Fernando is the Jean Baudrillard Fellow at The European Graduate School, and a Fellow of Tembusu College at the National University of Singapore.